A mapshape vector is an object that represents planar vector features with either point, line, or polygon topology. The features consist of x- and y-coordinates and associated attributes. Attributes that vary spatially are termed Vertex properties. These elements of the mapshape vector are coupled such that the length of the x- and y-coordinate property values are always equal in length to any additional dynamic Vertex properties. Attributes that only pertain to the overall feature (point, line, polygon) are termed Feature properties. Feature properties are not linked to the autosizing mechanism of the Vertex properties. Both property types can be added to a mapshape vector after construction using standard dot (.) notation. s = mapshape() constructs an empty mapshape vector, s, with these default property settings. s = mapshape(x,y) constructs a mapshape vector and sets the X and Y property values equal to vectors x and y.
s = mapshape(x,y,Name,Value) constructs a mapshape vector, then adds dynamic properties to the mapshape vector using Name, Value argument pairs. You can specify several name-value pair arguments in any order as Name1,Value1,...,NameN,ValueN. s = mapshape(structArray) constructs a mapshape vector, assigning the fields of the structure array, structArray, as dynamic properties. Field values in structArray that are not numeric, logical, string scalars, string arrays, character vectors, cell arrays of character vectors, or cell arrays of numeric, logical, or cell array of character vectors values are ignored. s = mapshape(x,y,structArray) constructs a new mapshape vector, sets the X and Y properties equal to vectors x and y, and sets dynamic properties from the field values of structArray. mapshape class is a general class that represents a variety of planar features. The class permits features to have more than one vertex and can thus represent lines and polygons in addition to multipoints. For more about the property types in mapshape, see Collection Properties, Vertex Properties, and Feature Properties. Dynamic properties are new features and vertices that are added to a mapshape vector. You can attach dynamic Feature and Vertex properties to a mapshape vector during construction with a Name,Value pair or after construction using dot (.) notation after construction. This is similar to adding new fields to a structure. For an example of adding dynamic Feature properties, see Construct a Mapshape Vector with Dynamic Properties. Shape of all the features in the mapshape vector, specified as 'line', 'point', or 'polygon'. As a Collection Property there can be only one value per object instance and its purpose is purely informational. The three allowable values for Geometry do not change class behavior. The class does not provide validation for line or polygon topologies. Information for all the features, specified as a scalar structure. You can add any data type to the structure. As a Collection Property type, only one instance per object is allowed. Planar x-coordinates, specified as a numeric row or column vector, stored as a row vector. Planar y-coordinates, specified as a numeric row or column vector, stored as a row vector. Set the values of the existing X and Y properties and dynamically add the Vertex property Z. Create a mapshape vector specifying x and y. Create mapshape vector specifying a Name-Value pair. When Value is a cell array containing numeric, logical, or cell array of character vectors, it is designated as a Vertex property. Otherwise the Name-Value pair is designated as being a Feature property. Create structure array and then create mapshape vector with array. Read data from a shapefile into a structure. Create a mapshape vector specifying the structure. This example shows how to add a single feature after construction of the mapshape vector using dot (.) notation. Add a dynamic Vertex property to the first feature. This extended example adds multiple features that are both Vertex and Feature properties. It also demonstrates property behaviors when vector lengths are either changed or set to [ ]. Add a two element dynamic Feature property. Add a dynamic Vertex property. Add a third feature. The lengths of all the properties are synchronized. Set the values for the Z vertex property with fewer values than contained in X or Y. The Z values expand to match the length of X and Y. Set the values for either coordinate property (X or Y) and all properties shrink in size to match the new vertex length of that feature. Set the values for the Z vertex property with more values than contained in X or Y. All properties expand in length to match Z. Remove all dynamic properties and set the object to empty. Create a mapshape vector specifying several name-value pairs. Load the data and create x, y, and z arrays. Create a level list to use to bin the z values. Construct a mapshape object and assign the X and Y Vertex properties to the binned x and y values. Create a new Z Vertex property to contain the binned z values. Add a Levels Feature property to contain the lowest level value per feature. Add metadata information. Metadata is a scalar structure containing information for the entire set of properties. Any type of data may be added to the structure. 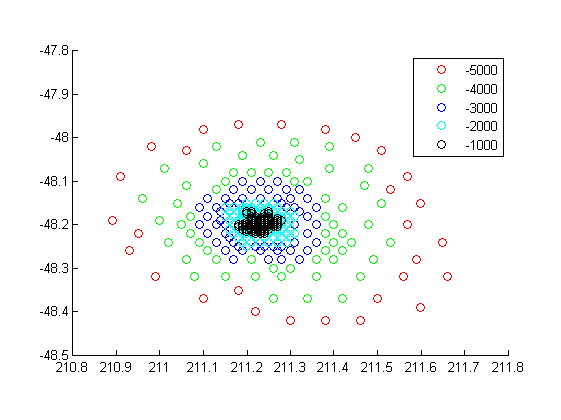 Display the point data in 2-D. 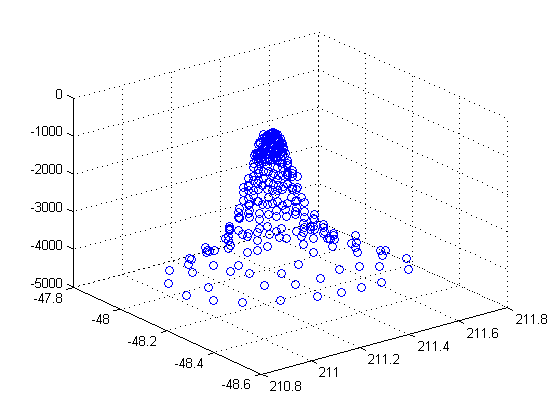 Display data as a 3-D scatter plot. This example shows how to use selective indexing behavior of a mapshape vector, and how to add a Metadata property. Add a Filename field to the Metadata structure and then construct a new mapshape object with only CLASS 4 (major road) designation. This example show how features can be sorted by using the indexing behavior of the mapshape class. You can create a new mapshape vector that contains a subset of dynamic properties by adding the name of a property or a cell array of property names to the last index in the ( ) operator. Read data from file directly in mapshape constructor. Modify the mapshape vector to contain only the specified dynamic properties. Create a new mapshape vector in which each feature contains the points for the same year. Copy the data from a mappoint vector to ensure that NaN feature separators are not included. Create a subsection of data to include only Year and Country dynamic properties. Display the third from the end feature. Vertex properties provide a scalar number or a character vector for each vertex in a mapshape object. Vertex properties are suitable for attributes that vary spatially from point to point (vertex to vertex) along a line. Examples of such spatially varying attributes could be elevation, speed, temperature, or time. X and Y are Vertex properties since they contain a scalar number for each vertex in a mapshape vector. Attribute values are associated with each vertex during construction or by using dot notation after construction. This process is similar to adding dynamic fields to a structure. Dynamic Vertex property values of an individual feature match its X and Y values in length. Feature properties provide one value (a scalar number, string scalar, or a character vector) for each feature in a mapshape vector. They are suitable for properties, such as name, owner, serial number, or age, that describe a given feature (an element of a mapshape vector) as a whole. Like Vertex properties, Feature properties can be added during construction or by using dot notation after construction. If X, Y, or a dynamic property is set with more values than features in the mapshape vector, then all other properties expand in size using 0 for numeric values and an empty character vector ('') for cell values. If a dynamic property is set with fewer values than the number of features, then this dynamic property expands to match the size of the other properties. If the X or Y property of the mapshape vector is set with fewer values than contained in the object, then all other properties shrink in size.